Robert Cialdini's book, Influence - The Psychology of persuasion talks about 6 comprehensive principles that guide human behaviour. The first principle universal principle of influence is reciprocity. "Simply put, people are obliged to give back to others the form of a behavior, gift, or service that they have received first." There is not a better place than the internet to validate this. 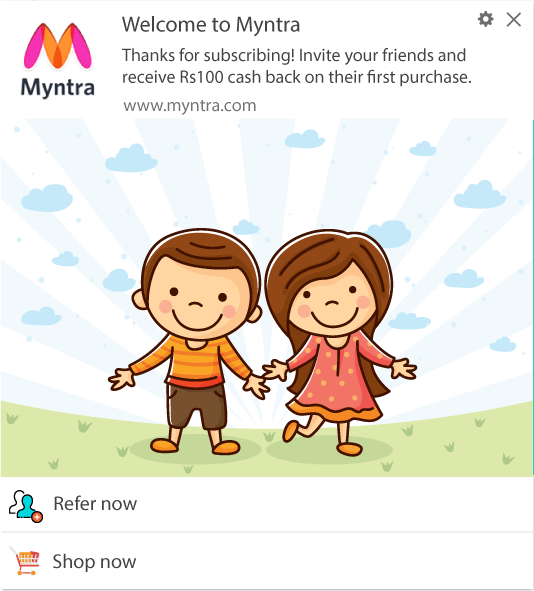 As a user, does it not feel good when you are been acknowledged, given importance and bestowed with exclusive offers? For the first time website visitors, giving a warm welcome becomes essential to show that you appreciate them visiting the website. Using web push notification you can convert your anonymous website visitors into audience. As these users subscribe to push notifications, reciprocating their action with a welcome notification that presents a unique offer is a great way of kickstarting a relationship. The welcome notification also assures the user that they have successfully subscribed to your website. Thanking people is an essential part to make users feel valued and welcome notification plays a pivotal role in making this happen. The concept of acknowledging and welcoming users is extremely powerful yet marketers don't recognise it. When you subscribe for a newsletter or catalogue updates over email, over 74.4% of consumers expect a welcome email. This is applicable for web push notifications as well. As a channel, web push notification is a fairly recent phenomenon but has a very high impact on user engagement. Welcome notifications are exactly like the welcome emails that you receive once you subscribe to a newsletter. 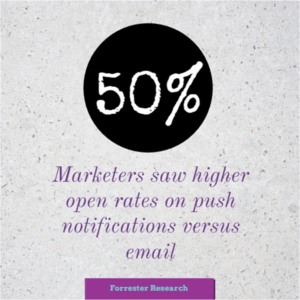 But unlike emails, push notifications have higher impact and a far higher chance of being noticed as they enjoy a far higher visibility. Make sure that you roll out these automated welcome notifications within 10-30 seconds of subscription confirmation. Hence, making users happy with exciting offers and attracting them in a few seconds of subscription. It is crucial to reach out to the customer at the right time and encourage them to engage with you. The welcome notification is your first personal interaction with your subscribers. So make it a good one. Haven't we heard all our lives that the first impression is the best impression? Welcome notification is your shining gem that can impress your users within seconds. 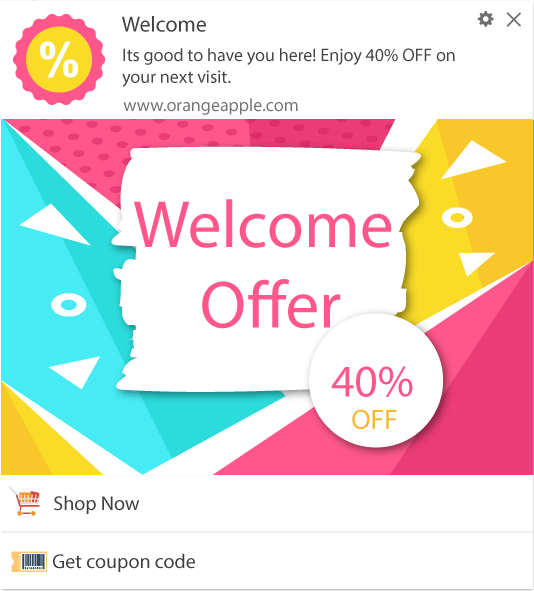 Hence welcome notification templates need to be incorporated into creativity and attractive offers that will inspire the users to click on them. These as the five welcome notification templates that you need to have a look at. Once they subscribe, your notification should welcome them. 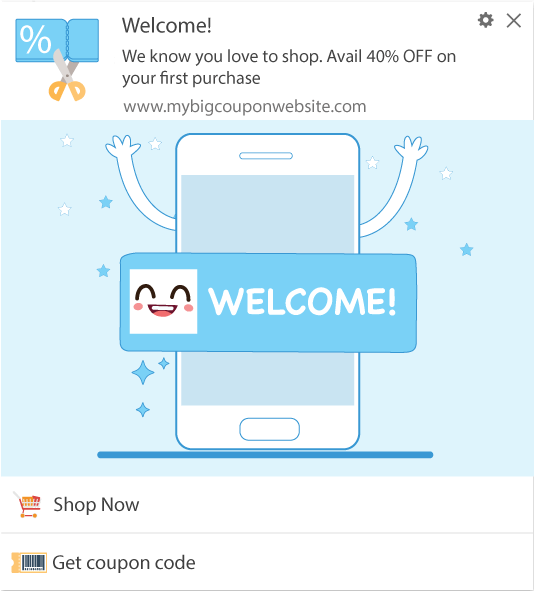 What would be more welcoming than you providing them with offers that they can't resist clicking on? Give them discounts on the first purchase that they make, which would give them the right nudge to buy something from your website and encourage them to endeavor in future purchases. Create an instant connect and drive more sales by triggering emotions. Check out 40+ irresistible web push templates that users can't help but click. Increase the chances of users buying on your site by attracting them with exciting discounts and creating a sense of urgency. Notifications which specify the duration of offer increase the chances of them clicking or your CTA. Yes, they subscribed to your website. But how do you drive them back? You might have amazing offers, but sometimes users need an extra push to come revisit your site. How do you make an offer they can't resist and also ensure that you are driving in repeat traffic? Its simple, provide them an offer stating that they will get a discount on their next purchase. It's sure to drive them right back to your site. Emoticons play a vital role in giving expressions to all your words. Let them know how elated you are with their subscription. Shower them with exciting offers and turn on the party mode. It is not only important to welcome new users with incentives, but also encourage them to refer others. Inform them about your referral program and the benefit that they can get out of it. This not only motivates the subscriber but also builds your chances of gaining new users. These are 5 welcome notifications that have the potential to convert subscribers into customers. Check out iZooto tutorials to define iZooto’s welcome notification in a few simple steps and create an outstanding red carpet ready welcome template. Know more about Web Push Notifications here. Engage users from day zero. Try web push notifications for Free!